LOUISVILLE, Ky. (April 1, 2018) — The Tampa Bay Rowdies fell to their first defeat of 2018 on Saturday afternoon, falling 1-0 to the defending USL Cup champions Louisville City FC at Slugger Field. Louisville midfielder Oscar Jimenez scored the only goal of the match in the 69th minute. Neither team looked particularly dangerous on the day, with both sides being limited by field conditions that were not conducive to playing the ball along the ground as both teams prefer to do. Two noteworthy streak ended Saturday afternoon in Louisville. Coming into the match, the Rowdies had scored at least one goal in every match they played since July 1 of 2017, a streak of 19 consecutive matches with at least one goal. That was the longest streak in modern Rowdies history. Georgi Hristov also had a personal streak snapped in the way. Through last weekend’s win over Bethlehem, Hristov had scored a goal in six consecutive matches. He had only one shot on Saturday afternoon and it missed the target. New streaks can begin this weekend when the Rowdies try to get back to winning ways against Ottawa Fury FC at home. Though the match wasn’t even in the one place it truly mattered — the scoreboard — the Rowdies and Louisville City stood toe-to-toe Saturday night in a very even contest. Neither team established a real edge in possession or passing accuracy. 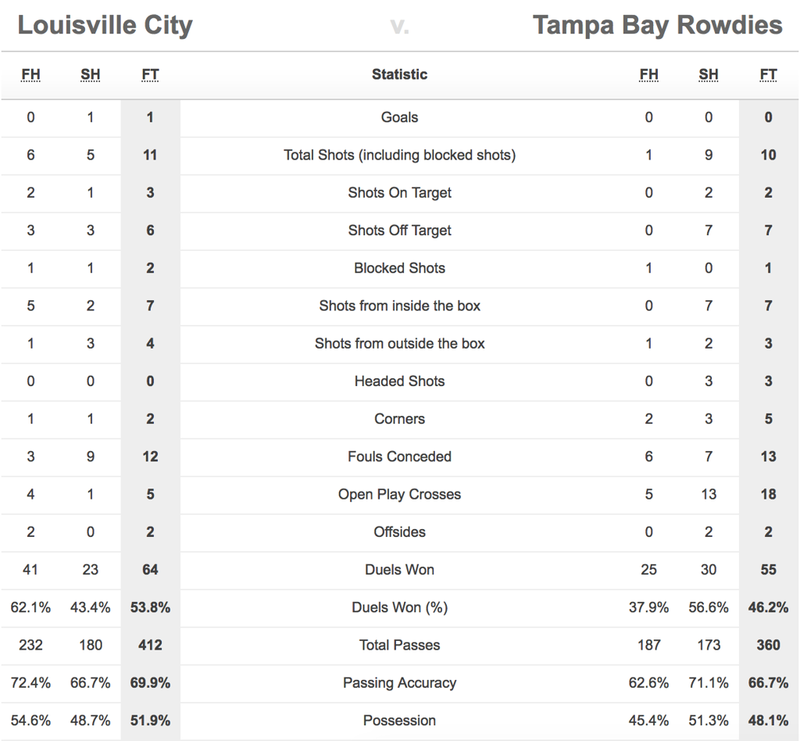 Louisville claimed a slight edge in shots (11 to 10) and shots on target (3 to 2.) The decisive moment of the match, Jimenez’s goal, came in the seconds immediately following Rowdies defender Neill Collins’ cleat falling off, sending Tampa Bay’s backline into panic mode as Lance Rozeboom dropped back to fill in at center back. The match was so even that had Collins not suffered an unfortunate wardrobe malfunction, we probably would have been looking at a scoreless draw. Tampa Bay Head Coach Stuart Campbell made two changes to his starting XI, handing starts to midfielder Lance Rozeboom and forward Sebastian Guenzatti in place of Joe Cole and Junior Flemmings, respectively. For Rozeboom, it was his first start since joining the Rowdies this winter. Playing as the natural holding midfielder to keep things controlled on the road, Rozeboom put in a good shift. He completed 88 percent of his passes and intercepted four Louisville passes. He also tallied two tackles and one clearance.